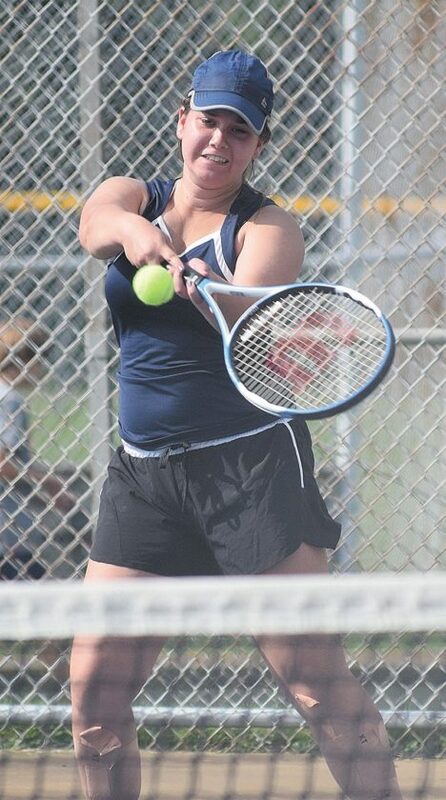 PHOTO BY JILL GOSCHE Columbian's Katie Smith hits the ball during a tennis match against Calvert Wednesday afternoon. Columbian and Calvert battled on the tennis courts Wednesday, but it was the Tornadoes edging the Senecas, 3-2. In singles play, Calvert’s No. 1 Devyn Warnement topped Columbian’s Katie Smith in straight sets 6-0, 6-0. Columbian responded with No. 2 Casey Knutson beating Maria Welter 6-1, 6-0 and No. 3 Calvert forfeited. At doubles, Calvert’s No. 1 duo of Kara Brodman and Bria Coleman took down Linzi Boos and Erin Musil 0-6, 6-4, 10-2, while Columbian won the match at No. 2 doubles as Whitney Johnston and Morgan Amory defeated Calvert’s Hannah Welter and Victoria Ardner 6-0, 6-0. BELLEVUE — Bellevue was a close No. 3 singles match away from a sweep of Sandusky St. Mary’s Wednesday, but it did win, 4-1. At singles, No. 1 Rayven Whyde topped Sara Bias 6-3, 6-4, while No. 2 Leighann Motley beat Natalie Vargas 6-1, 6-0. At No. 3, St. Mary’s Mai Parish edged Kaitlyn Cullen 4-6, 7-5, 13-11. Bellevue rolled the two doubles matches as the No. 1 team of Ella Little and Alivia Hammons bested Madison Sherjo and Kate Milkie 6-0, 6-3. the No. 2 duo of Sage Garcia and Perla Monreal topped Hailey Banhensen and Julie Loeffler 6-4, 6-4. The Lady Red are 1-2. UPPER SANDUSKY — Upper Sandusky’s Jodi Smalley started the Rams off with a win at first singles, but it was all the Rams got as they fell 4-1 to Marion Pleasant. At No. 1 singles, Smalley beat Arielle Wenig 6-1, 6-3. Pleasant’s No. 2 Grace Davis defeated Emma Schoenberger 7-6, 6-2 and No. 3 Kyler Goebbel upended Calle Manzi 6-1, 6-4. In doubles, the Spartans’ No. 1 duo of Ashlynn Drollinger and Kayla McCoy beat Mara Smalley and Abby Davidson 6-1, 6-0, while the No. 2 team of Katie Wansik and Caryln Bower topped Hannah Frey and Emma Swihart 6-1, 6-0. The Rams fell to 0-4.